Most people who I’ve shown this to report peculiar distortions of the (familiar) faces either side. This phenomenon is clearly related to the limitations of peripheral vision. The second reason for posting this is much more personal and relates to my struggles over the years with a form of panic disorder (which I’ve blogged about before, e.g., here). The term `panic disorder’ has a very broad definition, so that different individuals experience different forms of panic attacks and they can also take very different forms for the same individual. For me, a “typical” panic episode begins with a generalised feeling of apprehension or dread. Sometimes that’s as far as it goes. However, more often, there follows a period of increasingly heightened awareness of things moving in my peripheral vision that I can’t keep track of, accompanied by auditory and visual hallucinations. I’ve tried to explain the latter in conversations with friends and colleagues and usually when I do so I describe how the faces of people around me become distorted in a grotesque and terrifying way. When that happens I usually run as fast as I can in whatever direction I can to get away. On top of the effect of these attacks themselves, there is also the frustration, when they are over, of not really understanding what had happened. What is happening in my brain when a panic episode begins? What is going on with my peripheral vision when it goes awry like it does? Why do some particular places or circumstances trigger an attack but other, apparently similar, ones don’t? When I first saw the above video it struck me immediately that it might contain a big clue about these episodes, as the facial distortions that appear there are very similar to what I experience. Perhaps what goes wrong is that peripheral vision takes over from central vision, i.e. a kind of opposite of tunnel vision, as a result of some malfunction in the way my brain deals with peripheral data. Most of the time we just discard data from outside our line-of-sight unless it’s something extremely dramatic and disturbing (whether good or bad); presumably we can’t process everything across our entire field of view so we usually filter out observations coming from the edges. What seems to happen with me is that something interferes with this filtering process so that almost everything gets flagged with a danger signal. My response to these is to look about manically trying to establish whether the threat is real before, usually, just getting out of there as quickly as I can when it becomes overwhelming. Obviously, this isn’t a complete answer to any of the many questions I’ve asked myself about this but somehow seeing the effect in the video makes me feel more comfortable with what happens because at least I can see that others can experience a similar phenomenon, even if in very different circumstances. P.S. I should say that although about two years ago I quit the medication I was taking to control them, I haven’t had any of these psychotic episodes since then. Reducing stress by leaving my job at Sussex was almost certainly a contributing factor. A blog piece by Dean Burnett I read on on the Grauniad website yesterday set me thinking about whether I should post a personal comment in reaction to it. I never know what is the appropriate way to draw the line between the private and the public on In the Dark but since having a blog is clearly an exercise in self-indulgence anyway I thought I’d go ahead and write a piece. Dean’s piece is about nervous breakdowns, but it’s really about why “nervous breakdown” is not a very good name for what it purports to describe. Regular readers of this blog (both of them) will know that I went through one last year, and one thing I do remember is the disapproval that the term “nervous breakdown” provoked when I used it during my subsequent course of therapy. Apparently it’s a bit frowned-upon among professionals in the field. The term nervous breakdown is actually surprisingly old, and stems from a time when both “nervous” and “breakdown” arguably had different meanings to their modern ones. It seems the “breakdown” element refers to a breakdown in the same way that cars or other machines can break down. And nervous just refers to the nervous tissue. So originally it meant a fault or error in the nervous tissue that controls the body. And suddenly my interpretation doesn’t seem so literal. But this doesn’t mean it’s an invalid term, it’s just more of a rule-of-thumb or generalisation used to refer to what happens when someone becomes psychologically unable to function as normal. In the simplest sense it could be said that, mentally speaking, a nervous breakdown occurs when an individual finds that the number of things that they are able to cope with is lower than the number of things that they have to cope with. That seems to me to sum up very sensibly why the term is not very useful for an expert: it’s too vague, in that there are so many quite different things that might cause a person to become “psychologically unable to function as normal”. But it also explains quite well why its usage persists in popular language, in that the state of being “”psychologically unable to function as normal” is not as uncommon you might think. Anyway, if someone says they’ve had a nervous breakdown it gives at least a general idea of what they’ve experienced, although the specifics vary widely from individual to individual. I hope you’ll bear with me if I illustrate this with some personal observations in the light of my own experiences. I’ve suffered from a form of panic disorder for many years. Actually even that term has a very broad definition, so that different individuals experience different forms of panic attacks and they can also take very different forms for the same individual. For me, a “typical” panic episode begins with a fairly generalized feeling of apprehension or dread. Sometimes that’s as far as it goes. However, more often, there follows a period of increasingly heightened awareness of things moving in my peripheral vision that I can’t keep track of. This leads to a sense of being surrounded by threats of various kinds and panic ensues. Usually, at that point, I run. A typical panic episode lasts only a few minutes, but that’s not the end of it. For a considerable period (hours) afterwards I find myself in a state of hypervigilance during which I’m such a bundle of nerves that the slightest sound or movement can trigger a repeat. I tend to think of these episodes as being a bit like earthquakes. The milder ones happen fairly frequently, but they’re quite easy to cope with. I have altered my behaviour to avoid places likely to trigger them (see below) and to be aware of appropriate exit strategies. The more severe episodes are much harder to deal with, though, and when one starts there’s nothing I can do apart from try to find somewhere that feels safe, wait for it to pass and then just get through the aftermath, hoping for no aftershocks. In Dean’s piece he writes about the different stressors that can trigger a breakdown. In my case it was a bit more complicated than that. Thinking about the milder attacks I find it very difficult to identify specific triggers – they seem to occur more-or-less randomly. However, I can cope with this low-level “noise” pretty well. I’ve had plenty of time to get used to it, at least. The more severe attacks seem more likely to be triggered by specific places, especially if they’re crowded with people moving around – although I don’t always have a problem in places like that. To give an example, crossing the main concourse at Victoria Station is, for me, like descending into the abyss; I simply can’t do it, and have to go outside the station to get between the trains and the underground station. Paddington Station, on the other hand, is fine. Weird. I think the probability of one of these episodes is also influenced by background levels of stress arising from other independent things. Anyway, last year I got into a state in which I was experiencing multiple episodes per day. I couldn’t sleep or eat for over a week, and couldn’t leave the house for fear of experiencing another major problem. I think “nervous breakdown” is a pretty apt description for that period, but my breakdown was caused not by a new problem, but the amplification of an old problem to completely intolerable levels. The reason for writing about the anatomy of my breakdown in this context is twofold. One part is just to reinforce Dean’s point that a “nervous breakdown” can be triggered by many different circumstances and conditions. Mine is probably an unusual example, but I think everybody else’s is too. The other reason is to confess how frustrating it is to be a physicist who has experienced a thing like that. It seems natural that having experienced such an episode I should want or need to try to make sense of it, but I’ve struggled to do that. The way we’re used to thinking about things in physics is to make simple models that capture the relatively simple cause-and-effect relationships between relatively few variables, usually based on the objective analysis of data controlled experiments and/or systematic observations. This all involves trying to break down a phenomenon into its component parts so as to look at their separate action and thus establish the simple rules (if there are any) that govern the overall behaviour. The trouble with this analytic approach is that the human brain and its interactions with the external world are far too complicated and non-linear to be approached in the simple-minded way we physicists usually do things. Even if you accept that the brain is basically a collection of atoms communicating with each other using electrical impulses, that doesn’t mean that it’s useful to try to describe its action using atomic physics and electromagnetic theory. On top of all that, there’s the issue that neuroscience is a subject I know very little about at a technical level. There’s only room in my feeble little brain for my own specialism, so I lack the knowledge needed even to understand the literature. So although I got over my breakdown, it has left me with a huge number of questions I don’t even know how to begin to answer. What is happening in my brain when a panic episode begins? What is going on with my peripheral vision when it goes awry like it does? Why do some particular places or circumstances trigger an attack but other, apparently similar, ones don’t? I suppose you could consider this post to be my New Year’s resolution, so apologies that it’s three weeks overdue. Apologies too if it’s a bit too personal for comfort; it’s difficult to get the mixture of public and private right when you run a blog. Anyway, regular followers of this blog will know that I had some problems with my mental health last summer; I posted a partial explanation here. I completed a course of treatment last autumn and have since been feeling much better. Words can’t express my gratitude to the people who looked after me when I was unwell nor to the friends and colleagues who put up with my unexplained absences for so long. In November last year I came across a website run by Time to Change Wales which was in the middle of a campaign to get people talking about mental health issues. Among the things they were doing was getting people to post short blogs about their experiences in order to help people overcome the stigma that sadly still surrounds mental health. It seemed right to contribute something to this campaign, so I decided to write a piece for them. I probably don’t have to explain that I didn’t find this easy to do, and I changed my mind several times about what to include or indeed whether to send anything in at all. In the end I plucked up enough courage, and my piece went live last week. I was given permission to post it here also but, on reflection, I decided that might detract from the campaign by deflecting traffic from the Time to Change website. I also thought I’d leave it a while before referring to it on here; as it happens, there were also practical reasons why I haven’t had much time to blog in recent days. If you’d like to read the piece you can do so here. And while you’re there, why not check out the rest of the site? Or maybe even follow them on Twitter? Closer friends who know the whole story will realise that I’ve edited it quite severely; they’ll probably also understand why. I’d just like to add here a few things I left out because I didn’t think they were relevant in the context of the Time to Change campaign. 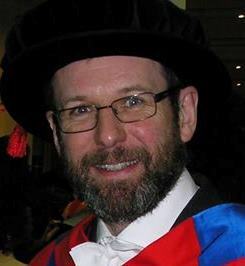 First, you will probably now appreciate the irony in the fact that I’ll shortly be returning to live in Brighton when I take up my new job as Head of Mathematical and Physical Sciences at the University of Sussex. That this opportunity came along when it did seemed so implausible a coincidence that I’ve almost started to believe in fate. I feel a bit like a character in a play with a very strange plot; I haven’t a clue how it’s going to end, but I’m obliged to act out my part regardless. In case anyone is wondering, before being appointed to my new job I did have to complete a medical questionnaire, and I did make a written statement about the problems I’ve had. I was more than a bit nervous about doing that, actually, and for a time I thought I’d get turned down. But instead of being declared unfit, all that happened was that I had a discussion with an Occupational Health Adviser who was very supportive. I know that my problems may recur, but now I know how to handle them I don’t see any reason why I can’t handle this new job either. I’m very much looking forward to it, in fact. I’m by no means an expert on mental health, but I couldn’t resist ending with a comment arising from my recent experiences. The human brain is an incredibly complicated thing which means that even when it’s functioning “normally” it gives rise to a vast range of personalities and behaviour patterns that largely defy categorization. Likewise, when things go wrong they can go wrong in so many ways that simple descriptions such as “anxiety” or “depression” aren’t really all that useful or even complete. You might think, for example, that panic disorder describes a fairly well-defined condition, but it really doesn’t. The things I have experienced during panic attacks – which includes alarming visual and auditory hallucinations as well as an overwhelming impulse to flee – are quite different from what others with panic disorder may describe. Post-traumatic stress disorder can likewise manifest itself in a wide range of behaviours, including extreme aggression. In my own case the dominant factor has been hypervigilance and I’ve never showed any sign at all of some of the other indicators. It’s no surprise, therefore, that there’s no ab initio theoretical understanding of what causes such conditions, and that treatment is largely by trial and error. In short, neuroscience isn’t at all like physics. It’s also very very much harder. I was having a chat over coffee yesterday with some members of the Mathematics Department here at the University of Cape Town, one of whom happens to be an expert at Bridge, actually representing South Africa in international competitions. That’s a much higher level than I could ever aspire to so I was a bit nervous about mentioning my interest in the game, but in the end I explained that I have in the past used Bridge (and other card games) to describe how Bayesian probability works; see this rather lengthy post for more details. The point is that as cards are played, one’s calculation of the probabilities of where the important cards lie changes in the light of information revealed. It makes much more sense to play Bridge according to a Bayesian interpretation, in which probability represents one’s state of knowledge, rather than what would happen over an ensemble of “random” realisations. Abstract A primary function of the brain is to infer the state of the world in order to determine which motor behaviours will best promote adaptive fitness. 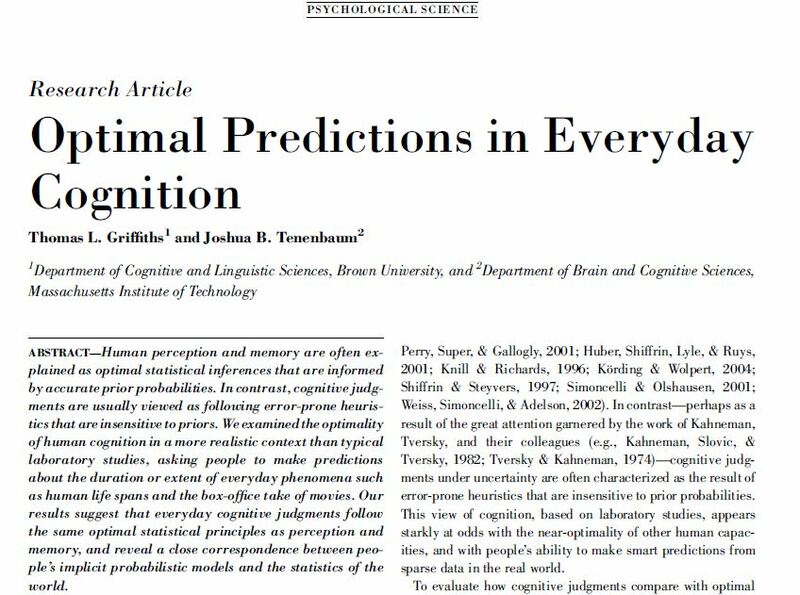 Bayesian probability theory formally describes how rational inferences ought to be made, and it has been used with great success in recent years to explain a range of perceptual and sensorimotor phenomena. As a non-expert in neuroscience, I find these very interesting. 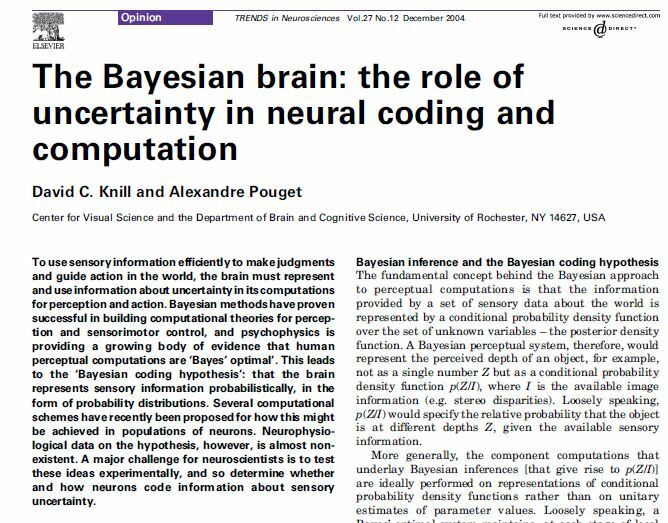 I’ve long been convinced that from the point of view of formal reasoning, the Bayesian approach to probability is the only way that makes sense, but until reading these I’ve not been aware that there was serious work being done on the possibility that it also describes how the brain works in situations where there is insufficient information to be sure what is the correct approach. Except, of course, for players of Bridge who know it very well. There’s just a chance that I may have readers out there who know more about this Bayes-Brain connection. If so, please enlighten me further through the comments box!